Food Fraud In The War Zone? Every month tens of thousands of cases of meat, seafood and baked goods are delivered to U.S. troops in Iraq - costing U.S. taxpayers tens of millions of dollars. Now Justice Department investigators are said to be digging into hundreds of millions of dollars in deals made by major U.S. companies that supply the military with food, CBS News chief investigative correspondent Armen Keteyian reports. Whether companies such as Perdue Farm, Sara Lee, and ConAgra set unusually high prices when they sold their goods to the Army's prime food contractor for the war zone. Whether or not that contractor, Public Warehousing Co., improperly pocketed so-called, "refunds" money it got back from its suppliers after these goods were sold. And what role, if any, current and former Army officials played in a possible kickback scheme involving Public Warehousing, known as PWC, and some of its vendors. Attorney Alan Grayson has filed dozens of lawsuits against military contractors, including PWC. "The American taxpayer should be outraged because money is being wasted and our troops are not getting the supplies they should for the money that's being spent," Grayson said. 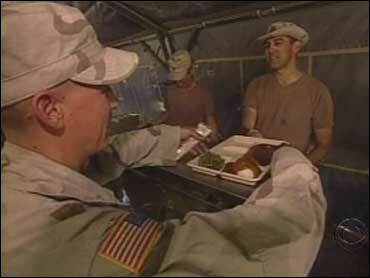 Based in Kuwait, PWC reportedly receives more than $1 billion a year to feed troops in Iraq. It has denied any wrongdoing, and says it has received positive reviews from government officials. But in April Tyson Foods, one of the world's largest chicken producers, sent this letter to the Pentagon complaining that compeditors were getting "the appearance of personal favoritism" in selecting suppliers. Sources tell CBS News that such complaints - dating back to late last year - may well have sparked the investigation - one of 78 such criminal probes of $5 billion in contracts now under review.